• Use as room keys, employee ID cards, VIP passes, etc. Whether it’s a single card or a large volume, our printers can produce the exact quantity you need on both memory cards and smart cards. They can encode magstripe cards on tracks I, II, and III. Text, logos, photos, bar codes, and various other images can be printed in color and monochrome on one or both sides. Include a guest’s name, check-in or check-out dates, room preference, company/organization, or event name. 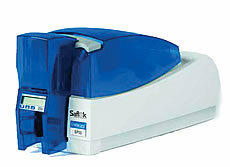 Each card printer can be used with System 6000™. This system offers a convenient way for hotels to have an access audit system, the ultimate key management flexibility, and superior control throughout the property, all in a Windows-based system. System 6000 easily interfaces with existing property management systems. The array of options available on System 6000 enables each property to have a completely customized system that is on the leading edge of access management technology.